Can the positives of healthy yoghurt outweigh the negatives of a sugary cereal? If the pressure of a stagnant sector wasn't bad enough, cereal manufacturers are feeling the heat once again after being named and shamed in the US for the amount of sugar in cereals. According to US campaigners Environmental Working Group, US kids are consuming more than 10lb of sugar a year if they eat a typical morning bowl of cereal a day. Its study, which covers more than 1,500 cereals, says children's cereals contain 40% more sugar than adult cereals. The group had re-examined 84 cereals it studied in a similar report in 2011. It found 11 cereals had lowered their sugar content but the "vast majority" of these were still too sweet to be healthy. One cereal added more sugar, the EWG said, adding: "Not one of the 10 on the most sweetened list in 2011 lowered their sugar content." In all, Kellogg's Honey Smacks was pointed out as one of the worst offenders with 56% sugar by weight. The study highlights breakfast cereal but adds to the growing scrutiny being placed on the food industry, its use of sugar and the purported links between the ingredient and poor health. At the turn of the year, there was a flurry of stories in the UK on the issue. According to the Centres for Disease Control and Prevention in the US, the percentage of children aged 6-11 years in the country who were obese increased from 7% in 1980 to nearly 18% in 2012. Robert Lustig, Professor of Paediatric Endocrinology at the University Of California, said: "Sugar is dangerous exclusive of its calories, just like alcohol. Children are the primary targets of marketing campaigns, and the least able to resist the messaging. That makes sugary drinks like the alcohol of childhood, which makes them obese. At the same time, this very large sugar intake is likely to put children at greater risk of developing fatty liver and diabetes." Speaking to just-food, Kellogg said it was "unfortunate" the EWG report "focuses on a single ingredient" and "ignores" research that claims those eating cereal at breakfast "have improved nutrition intakes and tend to weigh less". Kellogg said "over time" it had cut the level of sugar in its "top-selling kids' cereals by 20-30 percent". It added: "When you consider what constitutes a good breakfast, cereal and fat free milk pack a powerful nutritional punch; ower in fat and calories than many other breakfast choices, and including many nutrients that people might otherwise miss." However, the perception there are healthier alternatives for breakfast time has weighed on cereal sales in some markets, including the US, which has seen the rise of the protein-heavy Greek yoghurt. Kellogg has tried to defend the health credentials of cereal. Earlier this month, Kellogg boss said the company would look "to advertise the "benefit of protein that comes with cereal and milk". Nevertheless, for all the manufacturers' attempts to emphasise the "powerful nutritional punch" of cereal, reports like the study from the EWG willl only cause consumers to question more often what they eat for breakfast. 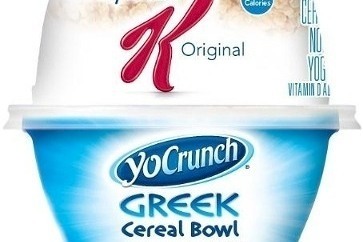 In fact, Kellogg this week signalled it had accepted it needed to broaden its offer, with a move into the US yoghurt sector, with its collaboration with Danone on the launch of the YoCrunch Cereal Bowl in the US.